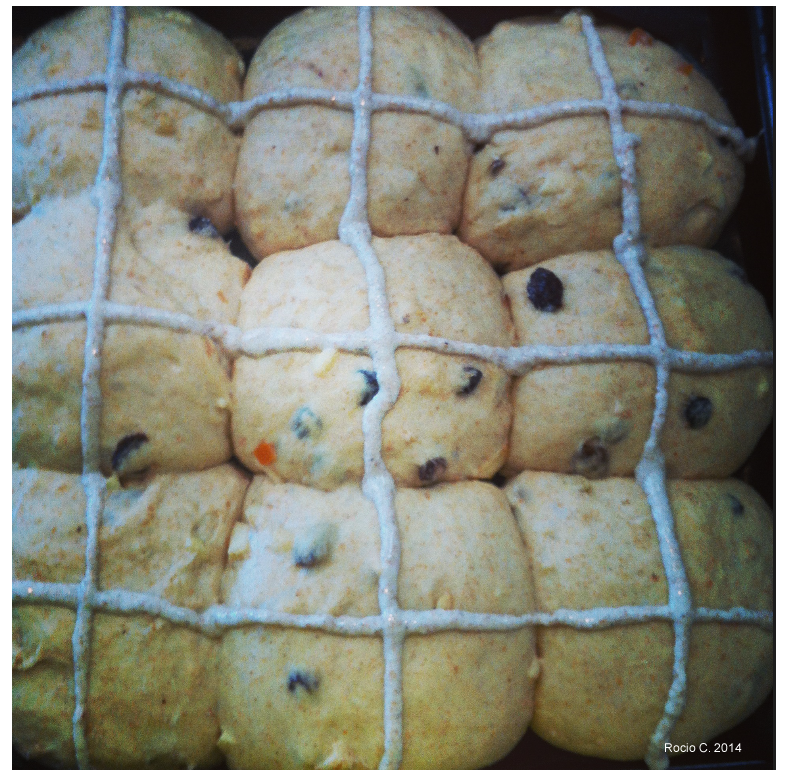 Super Spongy Hot Cross Buns | How to be the hero of your own kitchen! Method: Begin by hydrating the yeast in the warm milk, add the sugar to accelerate the fermentation, let it rest for about 15 minutes. In a bowl mix the flour, butter, egg and salt, add the hydrated yeast and combine by hand for a couple of minutes, then dust your working surface and knead the dough for about 5-8 minutes or until the dough is smooth, even and elastic. Fold into a tight ball and transfer to a greased bowl, cover with cling film or put it in a plastic bag and let it prove for 1 hour in a warm place. In the meantime, combine the raisins, mixed peel, orange zest and grated apple. After an hour, knock the dough down, transfer to a working surface, I’d advise you not to dust the flour but lightly oil the palm of your hands and work the dough to incorporate the fruits. Again form a tight bowl, put it back into the bowl, cover and let it rise a second time for 1 hour. Prepare one big baking sheet or two medium trays by dusting them with some flour. Pre heat the oven at 200°C. 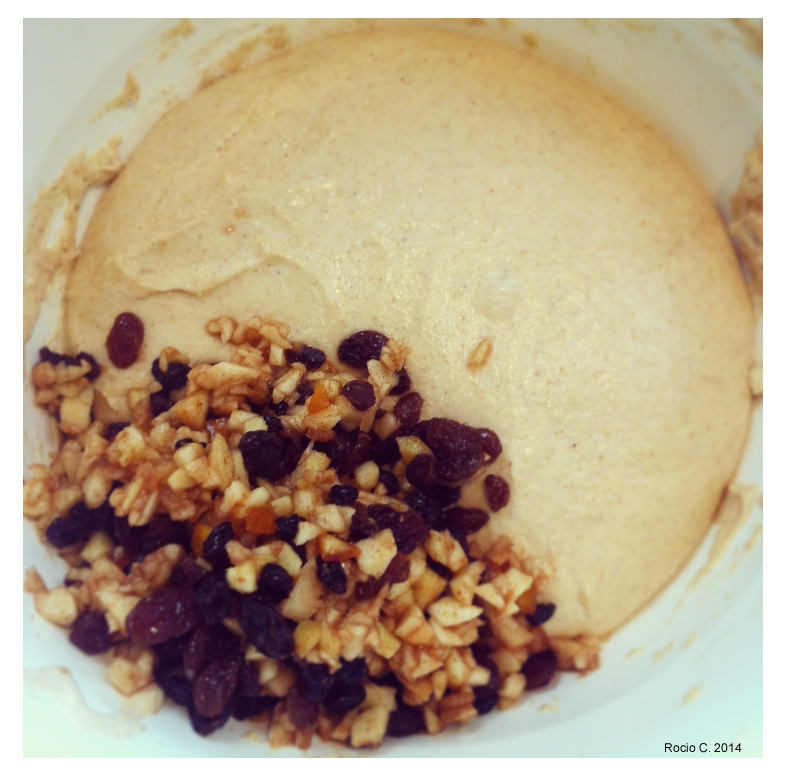 Transfer the dough on to your working surface and portion it. It’s much easier if you weigh it then divide it into the number of buns you want, weighing each portion individually, since you are baking either one or two batches it helps to have even buns. Roll each piece into a tight ball and arrange them in lines. Cover with a big plastic bag and let it prove for the last time for 1 hour. To make the crosses mix the flour and water to make a paste, you can either use a piping bag or any plastic bag and either use the smallest tip or cut a small corner of the bag and start forming one of the lines for the cross going up and down each bun trying to reach the bottom of each side, then go across the other direction. Bake for about 20 minutes or until the crust looks golden brown, use the middle shelf or else they won’t bake evenly. In the meantime warm up the apricot jam on a low heat, add a tablespoon of water and mix gently. When the buns are ready remove from the oven, transfer to a cooling rack and brush them with the jam, you want both the buns and jam to be warm so they absorb the jam, this will seal the crust and not only will they look glossy and shiny but this will keep them moist and fresh. Enjoy alone or have them sliced and toasted with some butter…*any* time of the year!